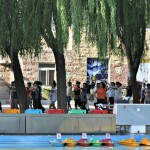 « Day 113 in Beijing: Chaoyang Park, Part 1. 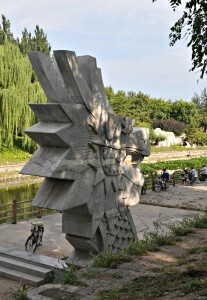 Day 114 in Beijing: Chaoyang Park, Part 2. So we hopped off the bus and started walking towards the park. Like many parts of Beijing, there are rivers running through the city and it allows for a little peace and beauty in a rather industrial and busy place. The Dragon Boat. Guarding all the fishermen. The River. Bruce Springsteen would be proud. As we walked down to the river, we spied this dragon lounging in the sun. 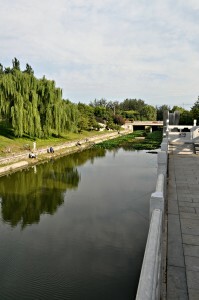 There were men fishing near it and the tranquility of the “old China” came rushing in to my mind. These people probably survive by fishing and being very frugal, especially in a metropolis like Beijing, and yet they seem content and flash smiles freely when I walk by. 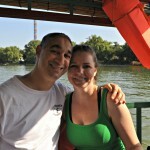 Jill and I took our time and soaked in the atmosphere as we slowly walked towards Chaoyang Park. 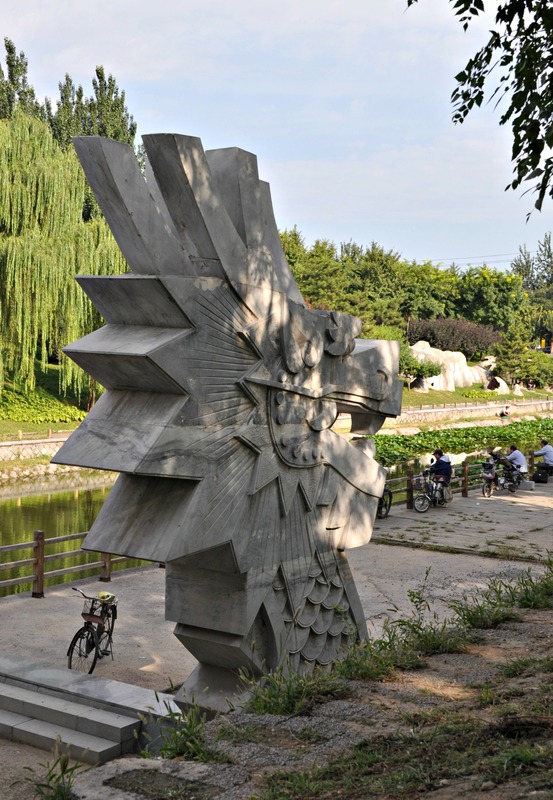 As we neared the entrance we looked at the sign describing Chaoyang Park. It is 300 acres of grassy lawns, man-made lakes, sports stadiums and exhibits. 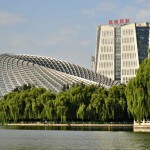 Some of the Olympic events, including the beach volleyball matches, were located at Chaoyang Park. After deciding we’d go in and see some sights before meeting our friends, we noticed the price for entrance. 5RMB. This is about 75 cents American for a full days pass into a huge park. It was 8RMB, or about 1 buck, for a monthly pass but we had to buy it by the third day of the month and we were well past that so we opted for the 5RMB pass. 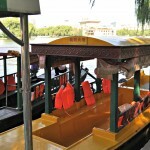 We walked in and were struck by the calm, quiet and peacefulness even though we were in the heart of Beijing. The traffic noise seemed to disappear into the clear blue sky and the crowds were non-existent. It reminded me of Golden Gate Park but cleaner, warmer, and more manicured. Jill and I walked over to a nearby lake and were planning to walk around it and then meet our friends. 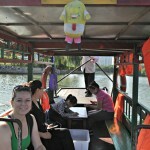 However, we noticed a sign near one of the boats stating that for 10RMB there were boat rides around the lake. It was 9 am on a Sunday and this sounded like the perfect way to enjoy the tranquility of this beautiful park. 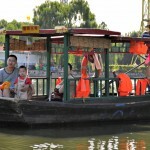 We paid our 20RMB and climbed onto the boat. 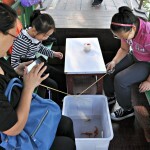 There was a mother and her two children in the boat and a bucket of goldfish that the girls attempted to catch. They did seem to enjoy talking to the fish and seeing if they’d respond. Sadly, the fish were disinterested in being caught, or spoken to, to say the least. We watched the elderly gentleman row the boat from behind and took our time looking at the park, the buildings with amazing architecture and the girls enjoying themselves. We passed one other boat during the 30 minute ride and it was wonderful. After some prodding by the gentleman rower, the girls got up and started rowing as their mother took pictures of them. I couldn’t resist and did the same. I’m glad I choose therapist as a profession instead of boat rower because all I did was send the boat in spiraling circles. At least we got some good pictures of me flailing away with the oars. The girls on the boat and the mom definitely got a good laugh out of it and kept giving me the “thumbs up” sign. Spongebob, looking a little worse for wear. Just another cool Beijing building. The fish were less than interested in being caught by the kids. The girls having a go at a row! 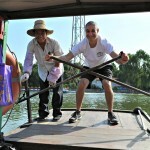 The boatman was laughing as I kept spinning the boat in circles! Jill and me hanging out on a gorgeous Beijing day! People dancing in the morning light.